The two-step at the trail challenge consisted of two steps made from railroad crossties and landscaped into steps. One step was higher than the other. The ground became increasingly muddy as the horses went up and down. The top step came about to the cinch on Jack. He took it in stride! Jack is shown here with Dustin at the AQHA Trail Challenge held in Hartman, Arkansas and hosted by the Horsemen of Arkansas. The event was also approved by the American Horsemen Challenge Association. The obstacle in this photograph requires the rider to back a full 360 degrees around a fire pit. There are four stumps placed as corners that the horse cannot go past essentially making you back a circle inside a square. 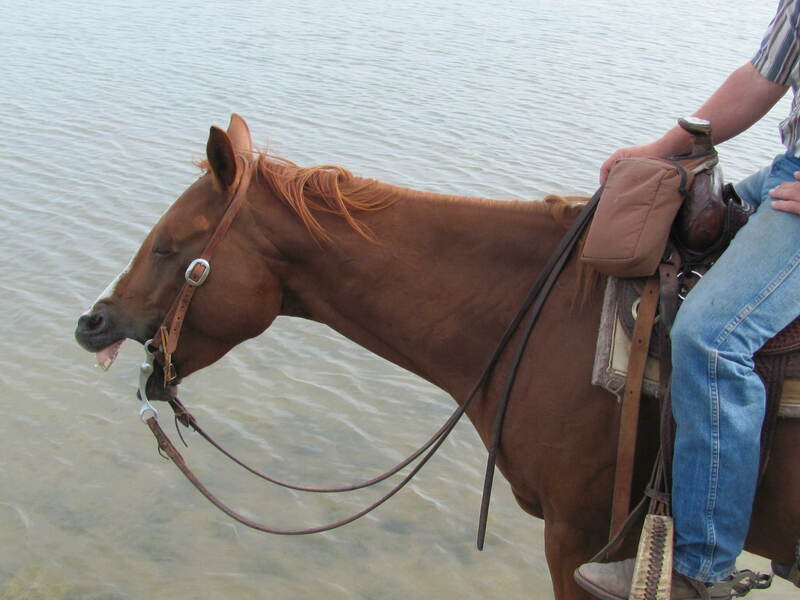 Jack, just like our other quarter horses has been trained to respond appropriately to new and unexpected situations. He displayed genuine interest in the challenge without ever showing any poor behavior or acting up. 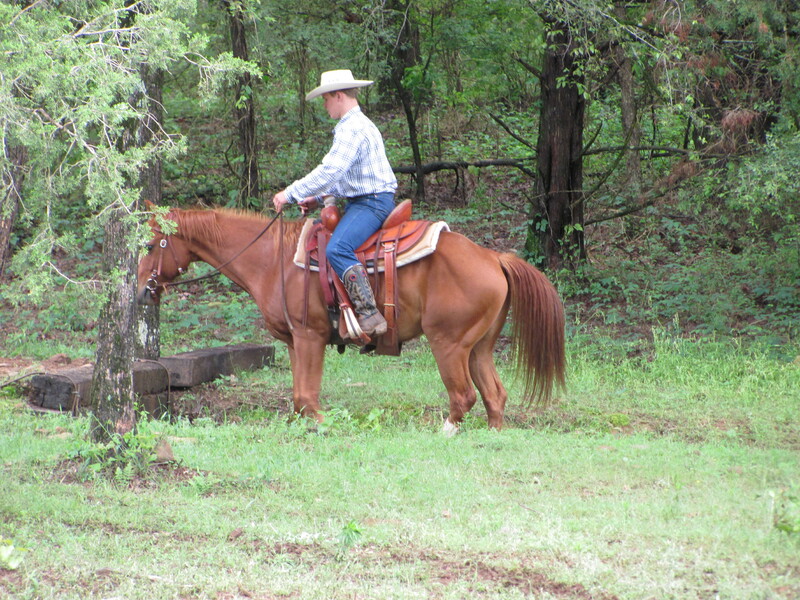 Jack is great on the trail and pays attention to everything without forgetting the training he has been given. Dustin had not ridden in nearly a month due to his job schedule when the challenge took place and had not ridden Jack for several months (bearing in mind Jack had been ridden by others). We felt Dustin and Jack did an exceptional job considering the lack of working together. The initial plan had been for Dustin to ride a different horse, but some confusion over getting the health papers to cross into Arkansas ended up with Jack as a last-minute substitute. Concrete scares some horses because of the sound and the change in texture. 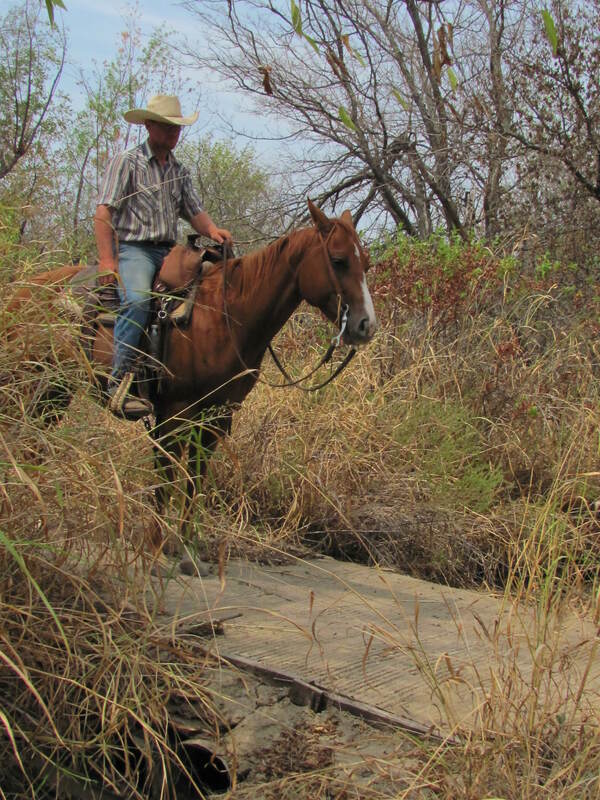 We have seen trail riders who could not take their horse across this simple concrete bridge. Jack is shown in the photograph walking towards the bridge and crossed it without so much as a second thought. When we first started riding this trail years ago, there wasn’t a bridge. Instead there was a mud hole and when it rained, the horses were knee-deep in mud. One of the trail riding groups managed to get a concrete bridge so you don’t have to ride into the mud anymore. But, we still see people over to the side of the bridge going through the mud because the horse they are riding refuses to cross. 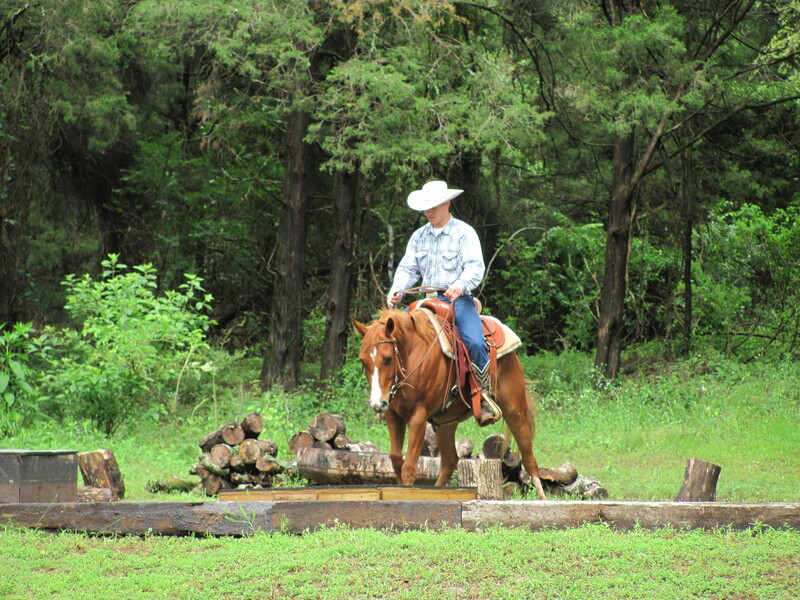 A good trail horse needs to cross concrete and pavement slowly and quietly. You never know when you may have to ride across a road or in some places a parking lot that joins the trail. Jack loves to go and really enjoys a good trail ride. After a fun day on the trail, it was finally time to go home. This was Jack’s reaction when he heard we were about to head back home. Look close and you can see the tears running down his face. 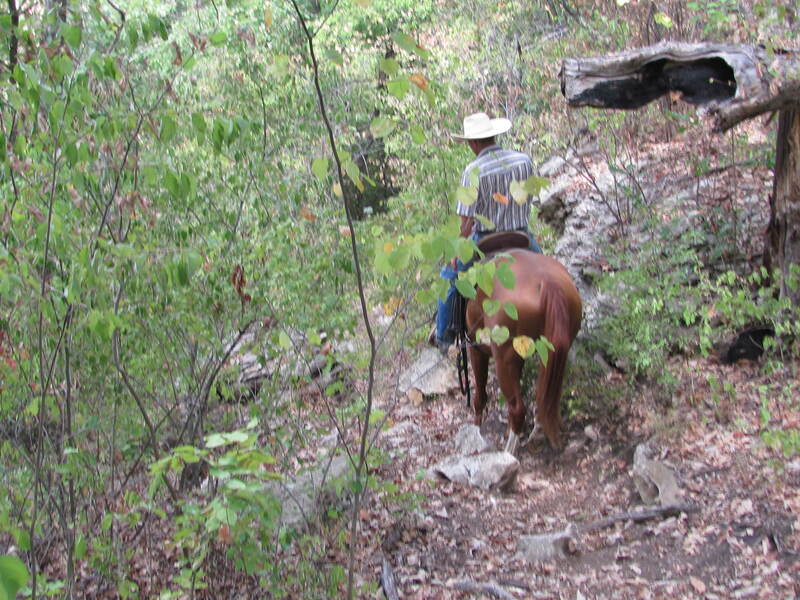 Trail horses are required to be surefooted, no exceptions! Once you’ve ridden a horse that is clumsy, you don’t forget the experience. A horse falling with you brings an adrenalin rush that we don’t especially enjoy. When you feel the horse start down, you have to decide whether to ride it all the way down or bail off. It’s no fun anywhere, but on a steep trail it can be extremely dangerous and even fatal. This photo makes it a little hard to see the grade and the rocks in the path on the way down. There were several rocks sticking out in the trail that could have easily caused a horse to stumble. The grade was steep enough in places to allow a horse to tumble head first if the front feet tripped. The horse in picture is Jack. He really pays attention to his feet and where he puts them. 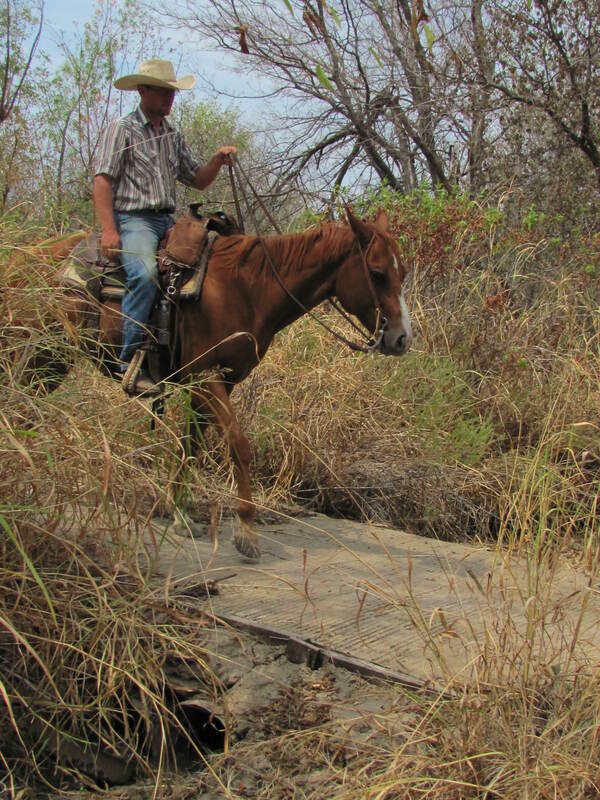 The horses in our training program are ridden into the rocks and rougher parts of the ranch in the first few weeks of riding. The purpose is to teach the horse early to pay attention to his feet while simultaneously learning to balance the load he carries. If the horse can’t figure out how to deal with the rider and the rocks, we don’t need to waste time with future training. As we said, a falling horse is unpleasant to say the least. Not to mention we have too many athletic horses in our horse training program to continue working with one that doesn’t have what it takes to make a sound trail horse. Jack is working his way towards graduation from our two-year training program. 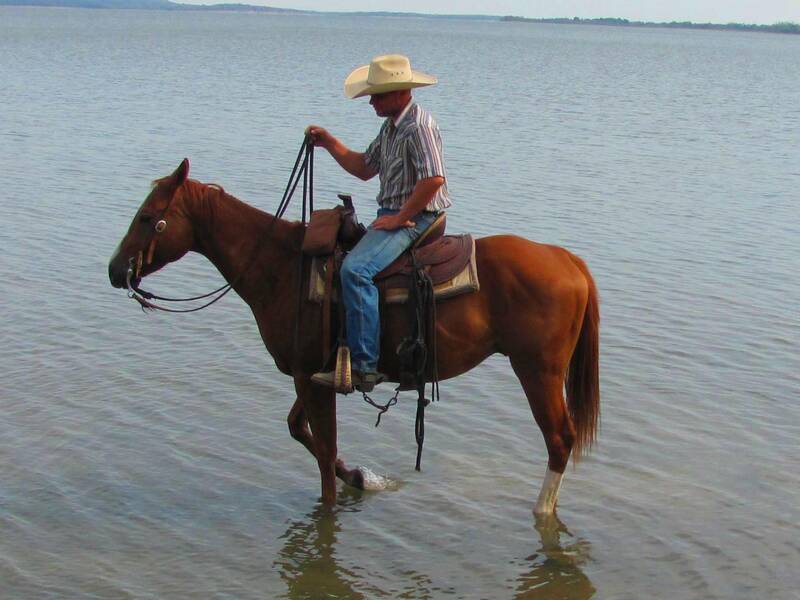 He is doing excellent and shown here being ridden in the middle of the lake. The horses that successfully complete the program demonstrate stamina, physical agility, strength, mental focus, calmness, and soundness in every way. Riding into water is not a big deal for Jack and this photo demonstrates his willingness to wade into a big body of water he had never seen before. Jack went straight into the lake without hesitation and up and down the shoreline through some slippery, muddy places with ease. He never showed the slightest anxiety and acted like he plays in the lake everyday. He is a hard worker and ready to attempt whatever is asked of him. Jack will graduate in May, 2013. Keep an eye on his him, he’s a nice horse. 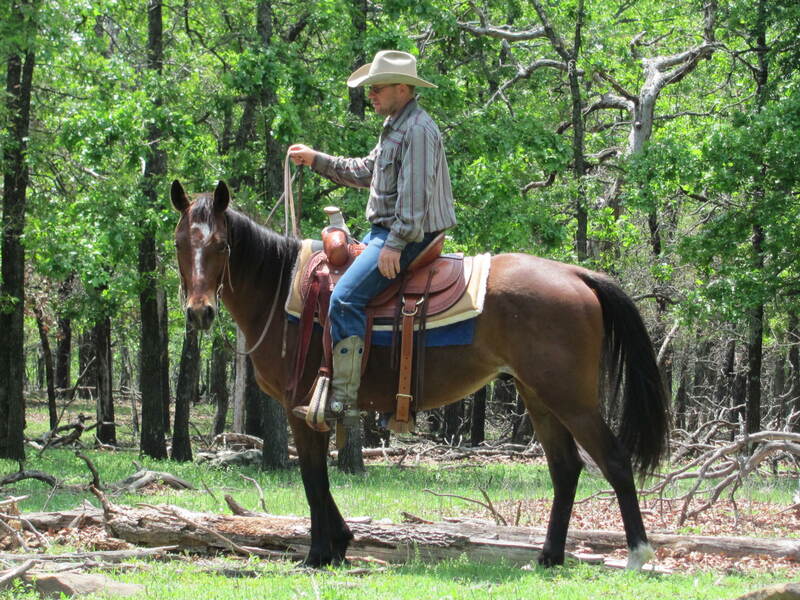 A trail horse should know how to ground tie. 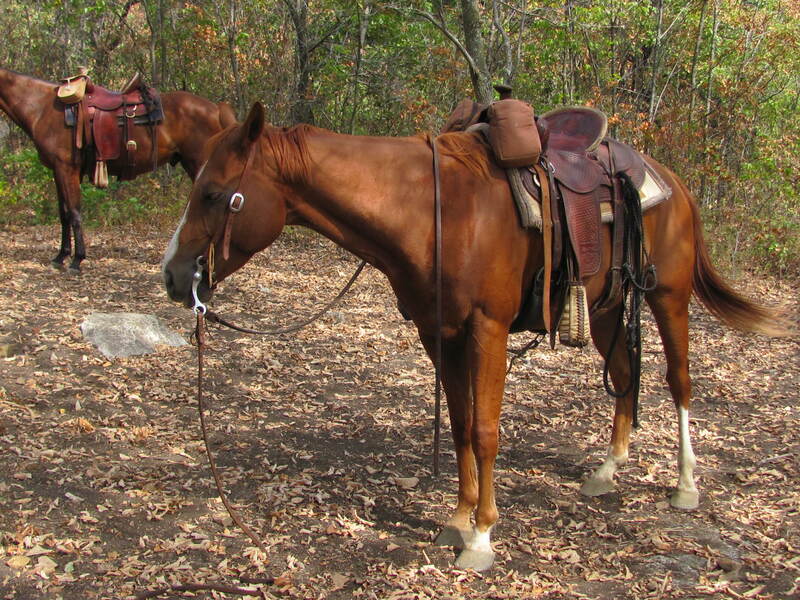 Here is Jack shown on a trail ride left standing without being tied to anything. The left rein was dropped to the ground and his rider walked away as a test. Failing the test meant his rider was going to walk back to the truck or be riding double behind someone else. 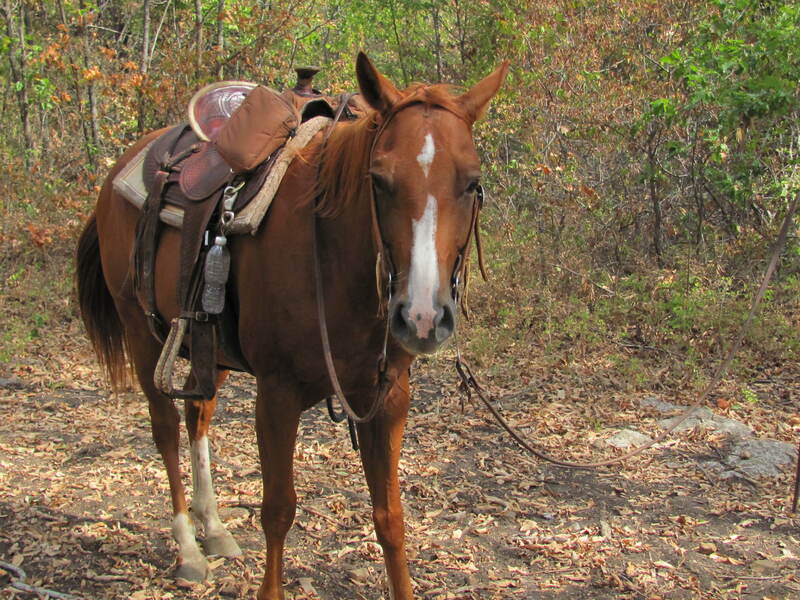 When you ride a lot, there are constantly situations that come up where you need to get off for some reason and there aren’t always good places to tie your horse. You need to be able to drop the reins without concern about your horse running away. It takes practice and repetition, but it is well worth the effort, unless of course, you like hiking! You are currently browsing the archives for the Meet Jack category.